Remember Sunday’s gospel reading with the parable of the ten virgins, five of which were wise and five of which foolish? If you don’t remember, then no problem! Here’s the gospel reading! 1“Then the kingdom of heaven will be like ten virgins who took their lamps and went out to meet the bridegroom. 2 Five of them were foolish and five were wise. 3The foolish ones, when taking their lamps, brought no oil with them, 4but the wise brought flasks of oil with their lamps. 5Since the bridegroom was long delayed, they all became drowsy and fell asleep. 6At midnight, there was a cry, ‘Behold, the bridegroom! Come out to meet him!’ 7Then all those virgins got up and trimmed their lamps. 8The foolish ones said to the wise, ‘Give us some of your oil, for our lamps are going out.’ 9But the wise ones replied, ‘No, for there may not be enough for us and you. Go instead to the merchants and buy some for yourselves.’ 10While they went off to buy it, the bridegroom came and those who were ready went into the wedding feast with him. Then the door was locked. 11 Afterwards the other virgins came and said, ‘Lord, Lord, open the door for us!’ 12But he said in reply, ‘Amen, I say to you, I do not know you.’ 13 Therefore, stay awake, for you know neither the day nor the hour. That’s… quite a parable, to be quite honest, full of lots of vivid imagery. So, I looked it up to see whether there were any artworks about this parable, and I was not disappointed! Check out this picture by William Blake! 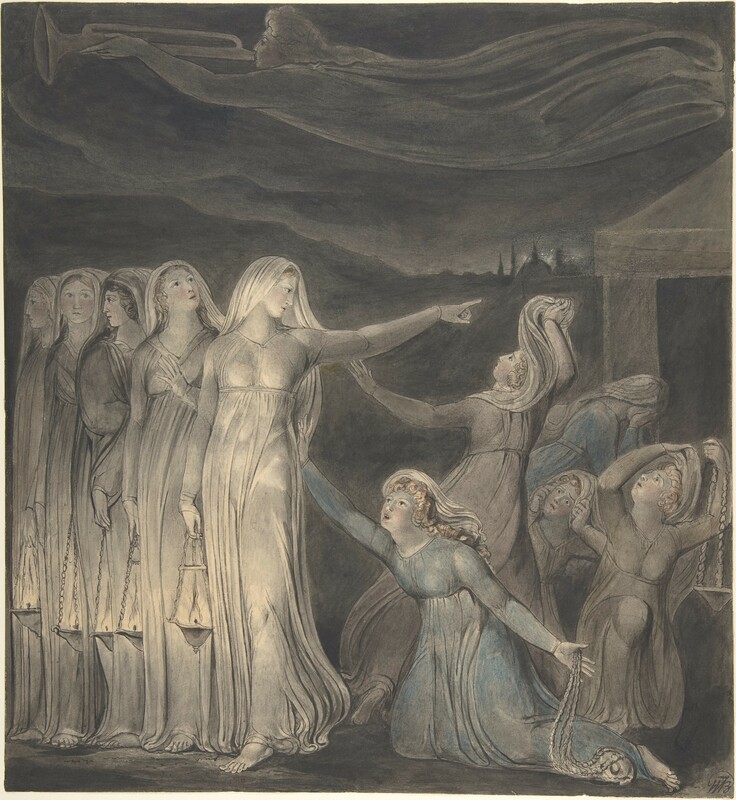 The Parable of the Wise and Foolish Virgins, by William Blake, c. 1799-1800. The Metropolitan Museum of the Arts, New York, New York, United States. It’s a rather sobering image! The five wise virgins stand erect and ready, their fires burning and their garments white, while the foolish virgins writhe and tear apart their clothes in anguish, each with a very different reaction. One is kneeling down and begging. Another simply stares crazily into space. Yet another one looks hopefully at the finger pointing to the oil, as if this will be her salvation. Another cries out in anguish. And the last runs away, her face hidden in despair. In the meantime, an angel calls for the Bridegroom to come at last, with imagery that recalls the Apocalypse. So, what does this parable mean? In my priest’s homily, he talked about how all the virgins symbolized those in the Church. So, it wasn’t like any of these Virgins were somehow innately unfit to see the bridegroom! But some had the light of faith, while others did not. Those others were like those plants rooted in shallow ground that Jesus talks about in yet another parable — they started in the faith, but they did not carry out Christ’s commands. And, honestly, this whole parable makes me a bit nervous. After all, do I have the light of faith? There are some days, I would say yes. But, there are many more days when I am exhausted and distracted in which I am not sure whether I do. And, even if I did, is my faith strong enough that, were something big to happen, I would be caught without oil just as the Bridegroom called for me? Honestly, that’s the whole reason that I started making my book in the first place: because I realized that I was getting more and more exhausted and spending less time in prayer. And, while sometimes I was too tired to think a cohesive prayer to God, I seemed to be able to focus on religious artwork and focus on God and pray to God in that way. Carrying extra reserves of oil to fill the lamps is one thing, but how exactly does one carry extra reserves of the light of faith? We certainly do not have that kind of strength by ourselves to keep up that sort of dedication for so long, especially in times of spiritual droughts! How can we be strong enough so that we, like the foolish virgins, do not get caught off guard? And the answer to that? Don’t depend on your strength: you can’t possibly do this. Depend on God’s strength. Follow Jesus and depend on His Light. Continue praying, even when sometimes it feels like you are merely yelling at God. (He’s patient… trust me on this.) And continue following Christ’s commands, even when sometimes you don’t feel like it. And then, who knows? Perhaps we may walk in Heaven together with Jesus! What was the first thing you noticed when you saw the picture? Why do you think that drew you in the most? Look at the faces of each of the ten virgins carefully. They’re all different. Which one’s expression do you identify with the most? Why? What are ways that you personally rekindle that flame of faith in your own life that you can realistically start today? Rekindle in us Your Light so that Your Light of faith does not diminish or run out. Give us the strength to follow You. As I mentioned above, my new book was actually made in an attempt to rekindle my faith… and maybe it can even help rekindle yours? Take a look at it here. I certainly see Blake in a new light, I never had much interest in him, possibly because l was never taught to really look at religious paintings and link the imagery with scripture.I like the ‘Questions to Ponder’ part. I was drawn into the horizon by the wise virgin pointing, possibly to Isaiah’s’ heavenly city, coming down like a bride, symbolised by the dome. Kind regards, Michael. I think with some of these later religious artists, especially those from predominantly non-Catholic places, that it’s important to note that the Reformation changed the focus of art to be less about the various traditions that the Church had and more about the bible. So, when you see their religious art, they are trying to literally portray the biblical scenes accurately. So, you can easily pair bible verses with these arts!